Fireplaces. There is nothing more gracious or appealing than a room with a fireplace. It gives the room a focal point, a mantel to decorate, and an instant air of home…home and hearth go hand in hand, after all. In my fantasy, I have fireplaces in multiple rooms in my house. And it IS possible to have this even if your house is currently lacking the charm of a fireplace or has a fireplace that is lacking charm…whichever. I mean, how appealing is this classically charming living room belonging to Linda from StoneCottage2255? Don’t you just want to park by that fire with a good book and a glass of something? Older homes often have wood burning masonry fireplaces and REALLY old homes ALWAYS have them – usually in every room since it was the only source of heat! Talk about a room with “good bones”! I have no idea what this room looked like before Alex worked his magic on it, but it is in a gorgeous old building in NYC and how can you go wrong with 12 foot ceilings, a stone fireplace, and a row of beautiful French doors? Gorgeous stone mantel in this NY showhouse dining room via Veranda. Design by Alex Papachristidis. Photo by Thomas Loof. For the rest of us mere mortals there are a couple of ways to get the charm and elegance of a fireplace if you don’t already have one. The pros: Wood fires smell delicious and crackle delightfully. You can torch old paperwork, toast smores, or destroy evidence (?!) 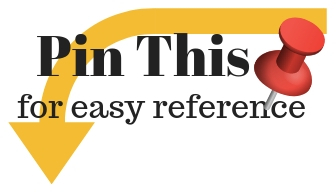 easily. The cons: Traditional masonry fireplaces generate heat with varying degrees of efficiency - most of which goes up the chimney, and they leave behind soot and ashes that are messy to clean up. And they can be an invitation to woodland creatures if you accidentally leave the flue open…I had a neighbor who woke up to find squirrels racing around her family room gnawing on the windowsills to try and escape – they had come in by way of the chimney. Below is the beautiful living room in the house of Jenny Rose Innes from her Instagram feed (which I recommend following). The fireplace is such a classic design and is styled with a charming collection of porcelain items - more porcelain is displayed in the adjacent shelves among the books as well. Many people prefer the ease of a gas log fire where you can have instant ambience with the flick of a switch, and heat if you want it, with the addition of a fan mechanism. 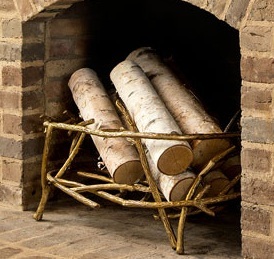 Wood burning fireplaces can be retrofitted with gas log inserts if you want the possibility of a fire without a Girl Scout badge and the resulting ashes to clean up. Other clean and instant options are electric and ethanol fireplaces. 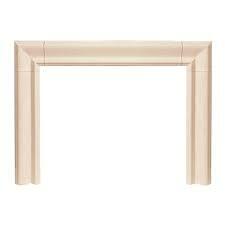 And barring any of those, you can still have a mantel with a faux fireplace! This faux fireplace was built-in to add charm to this master suite. The victorian oak mantelpiece was an item the homeowner had purchased at auction years ago and had never had a place to use. We built out the wall to create a faux chimney breast and raised hearth faced with quartz. The firebox was tiled with coordinating marble-look porcelain in a herringbone pattern. Fireplaces are high on the wish list for prospective buyers, so adding one to enjoy will also increase the value of your home. 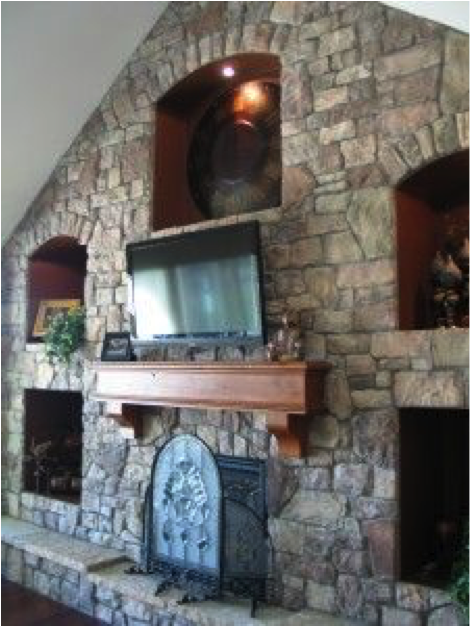 Depending on the type of fireplace you want, you can add a fireplace to any room on any wall - there are a variety of venting options and even ventless ones. And, like anything else, there are all sorts of price points and the cheapest are likely to look less realistic and/or be shoddily constructed which impacts safety, so shop carefully. Now for the fun part! 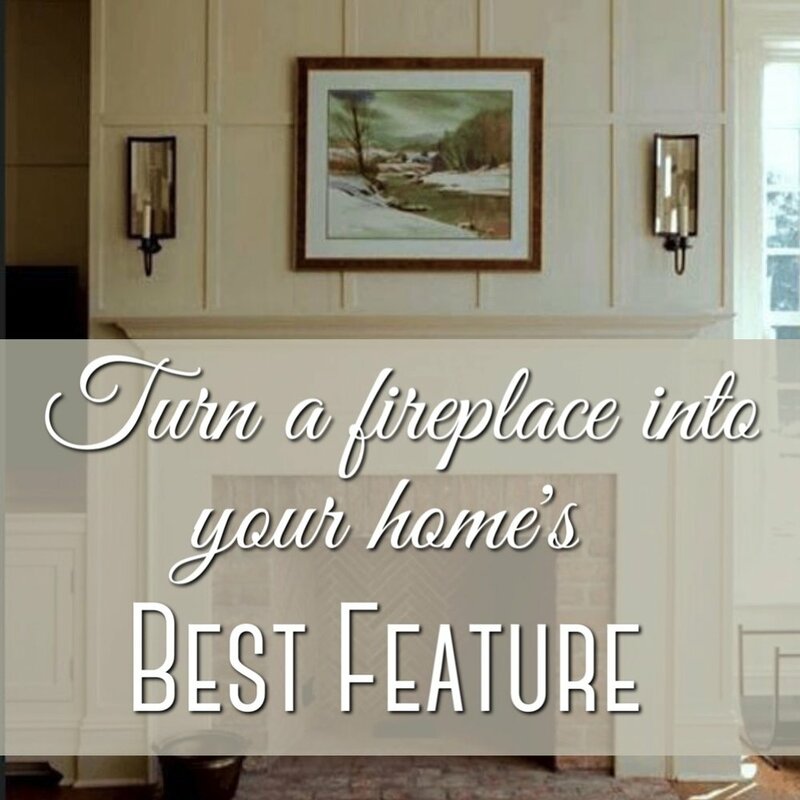 Fireplaces are wonderful decorating opportunities! 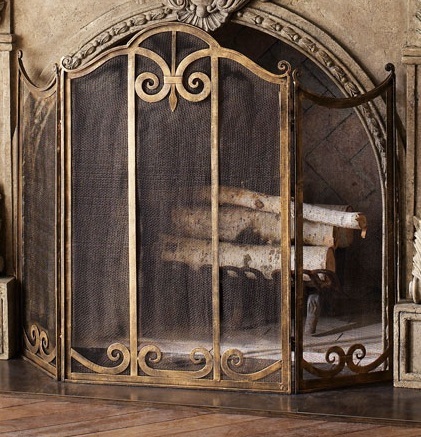 There are the accessories, andirons, fenders, and screens needed for a working (or at least the appearance of working) fireplace. 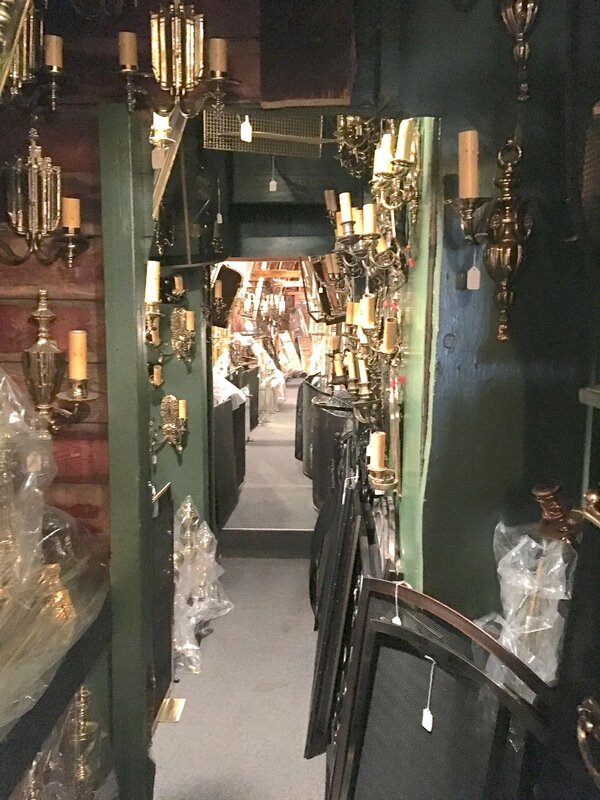 The Adams Fireplace Shop in Cambridge is a treasure trove of vintage fireplace accessories and equipment, as well as light fixtures - these are pictures I took from a visit there…the narrow aisles wind through a series of small buildings just crammed full of wonderful things! And then there are the mantels themselves which, if they contain a ledge or shelf, can be styled elaborately, showcasing a collection, or simply, with a mirror or single piece of artwork. They provide an opportunity for an ever-changing display. A pair of light sconces over the mantel is often a nice finishing touch. 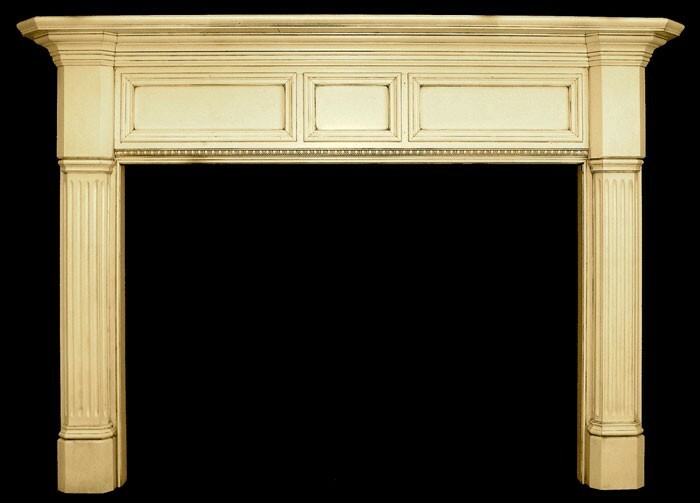 Mantels can be styled with strict symmetry for more formality, or a balance of objects for a more casual air. 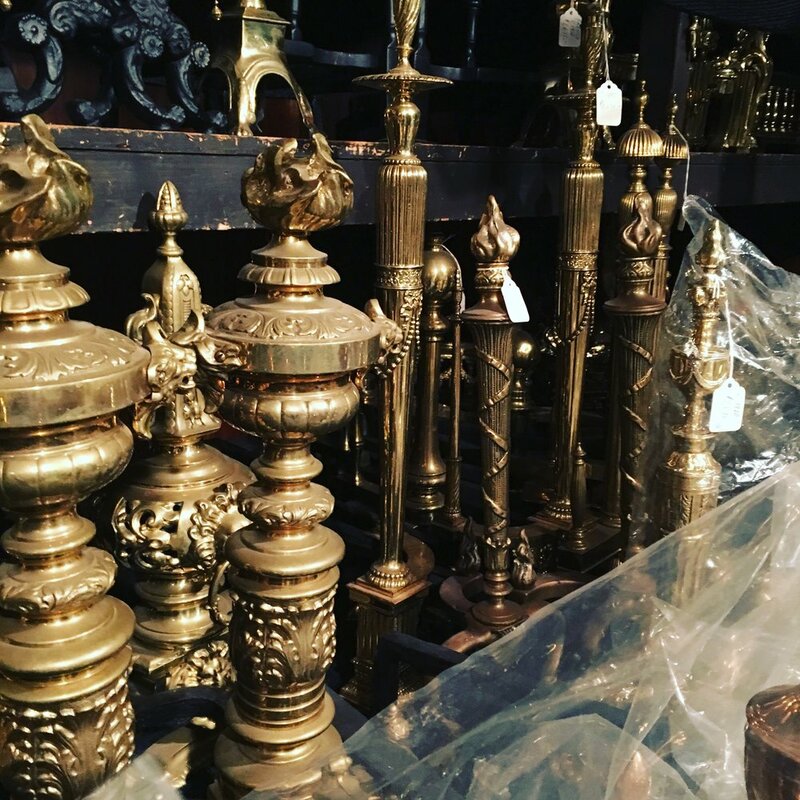 Plants trailing over the edges, topiaries, vases of flowers, plates or small artwork on stands or leaning, books, statuary, porcelain, candlesticks, holiday decor…there are an endless variety of ways to dress the mantel. This mantel was designed to match the existing millwork in the room and added to the existing stone fireplace surround. The new mantel shelf is topped with a pair of urns full of ivy, and a pair of antique Imari plates flanking a still life oil painting. The screen and andirons were found at the Adams Fireplace Shop mentioned above. 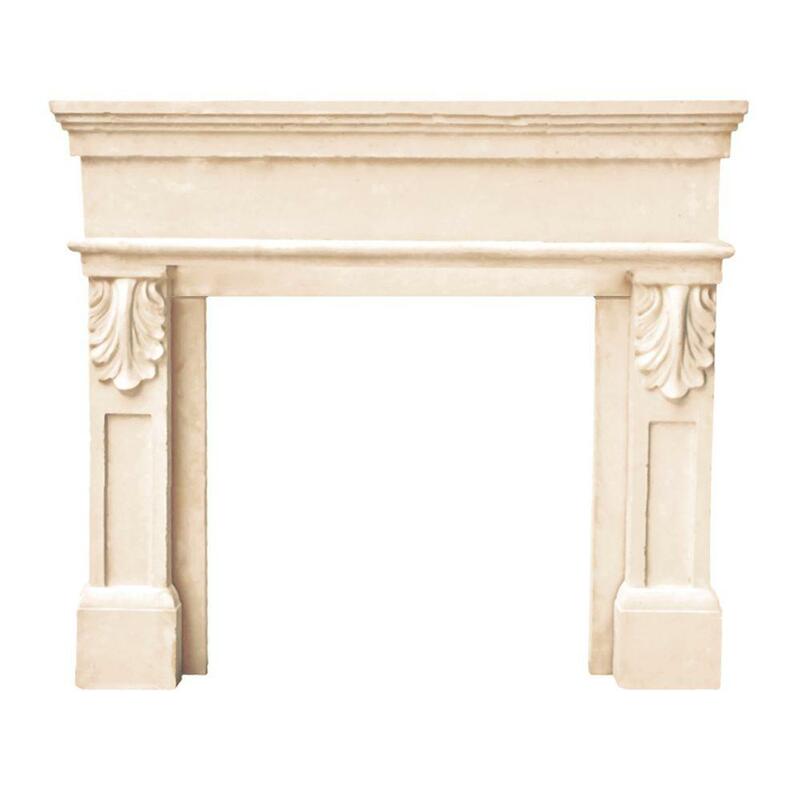 The mantelpiece can be part of a paneled wall or chimney breast, or made of marble or stone or carved wood, or the whole façade might be stone. The style of the room and architecture of the house will indicate which direction is most appropriate. This fireplace, with simple detailing that echoes the leaded glass in an adjacent space, is built into a wall with wainscoting. The very shallow mantel shelf is deliberately left unadorned. A pair of sconces flank a round mirror for a simple symmetrical arrangement. Stone facing is another option for a casual look to a fireplace…best suited to more rustic style spaces, but PLEASE don’t do either of these things…the multiple random niches one of which might actually be for a fire, or the truncated weird stone fireplace squeezed between two windows…there HAD to be a better solution. Well, this has gone on much longer than I planned, but I can’t leave you with those images. SO here is a lovely paneled apartment living space in NYC with a gorgeous built in wall including a fireplace - and what looks like doors above it concealing a TV perhaps. For more on practical styling tips for your mantel check out THIS post. In the meantime,..
Wishing you cozy fireplace daydreams!